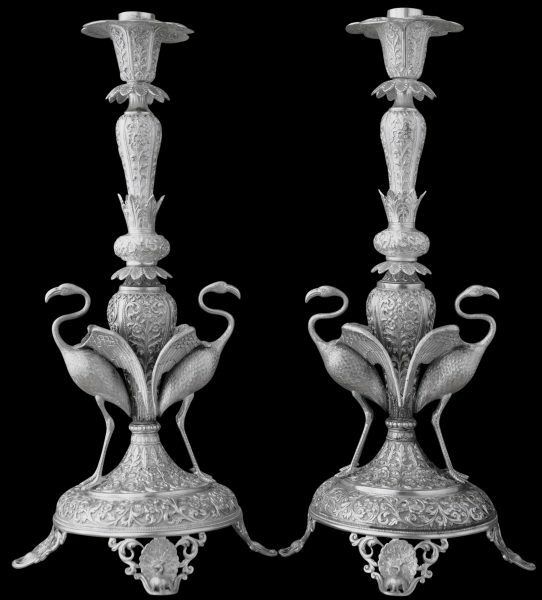 This extraordinary pair of candlesticks might well be unique. 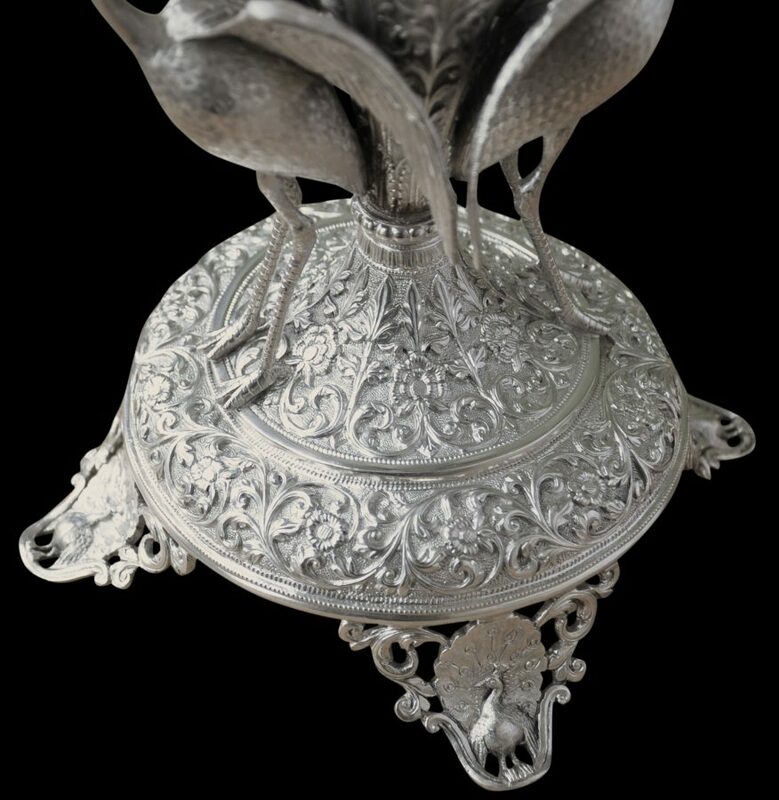 Certainly no equivalent pair has been published in any of the major reference books on colonial Indian silver, nor exhibited in any exhibitions. The pair are typically Cutch in motifs: they are chased all over with Islamic-inspired scrolling foliage and flowers against a ring-mat background. Of baluster form, they rise over various crenulations and fringes to a petalled platform into which the candles are to be inserted. They stand on four open-work feet, each of which shows a male peacock with his tail feathers fully extended. 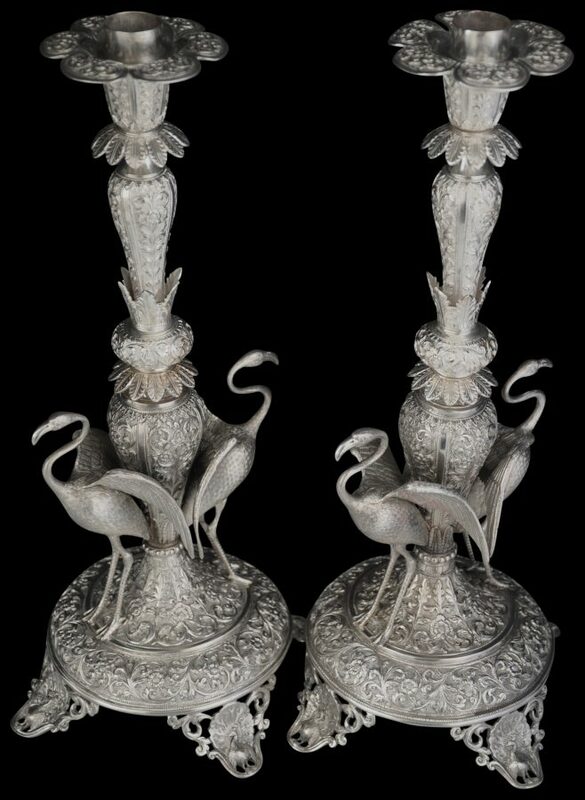 But the most remarkable aspect of this pair of course are the hollow-cast flamingos – two each stand on the base of each candlestick, with wings not quite fully extended. The detail of each flamingo is remarkable. The feathers are finely and clearly delineated on both the tops and the undersides of the wings. The fine feathers that clothe each body are clearly shown. The long, spindly legs, the wonderful ‘S’ shaped necks, the dainty heads and their oversized beaks are all naturalistically rendered. 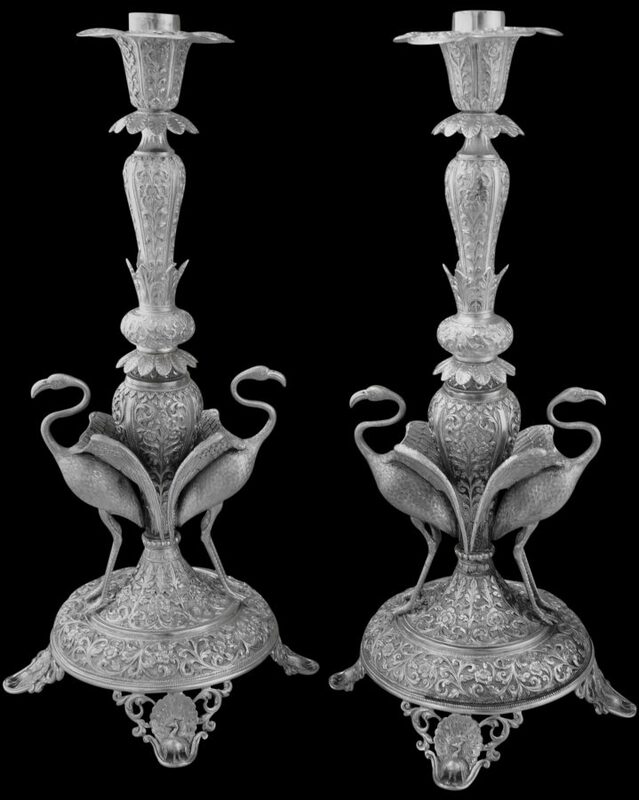 The candlesticks are not signed but the outstanding quality of the work plus the whimsical and unusual subject matter suggests that they are Oomersi Mawji, the celebrated Cutch silversmith. Their condition is superb. They have recently been cleaned but that cleaning might have been the first that they have had since being made. The details show no wear whatsoever from polishing over the decades and are as crisp as the day they were made. Nor are there are no dents, splits or repairs. 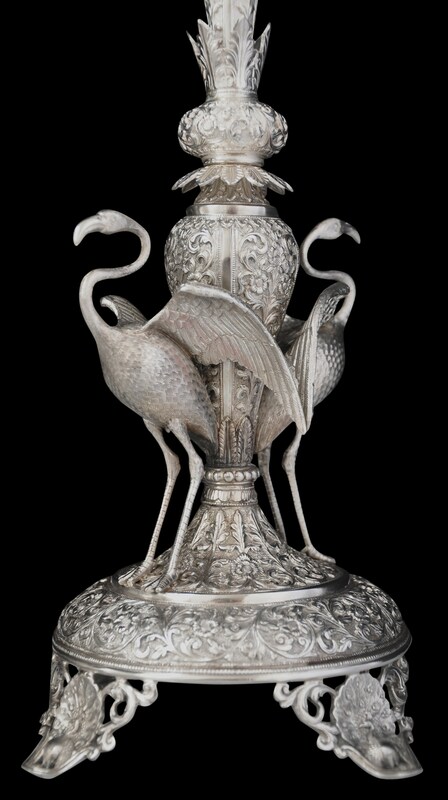 Overall, these almost certainly unique pieces would make a superb addition to any serious collection of colonial Indian silver. Terlinden, C., Mughal Silver Magnificence, Antalga, 1987.